Whether it’s basking in the sun or just lounging on a chaise like Mommy Coco Chanel (you know the iconic photo I’m talking about! ), a catnap is the best way to keep refreshed and youthful. 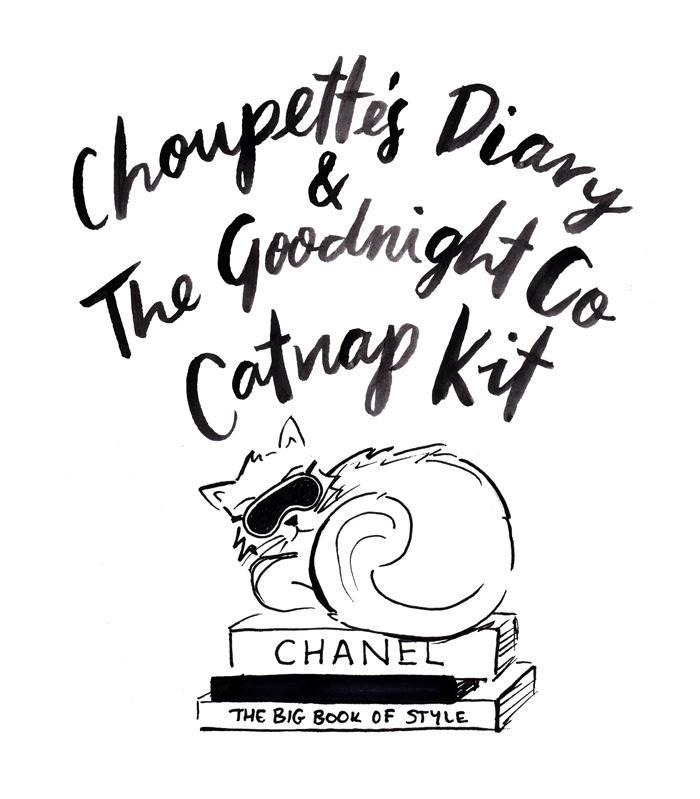 Celebrating my love of catnaps, I’ve partnered with The Goodnight Co. on the official Choupette’s Diary Captnap Kit. 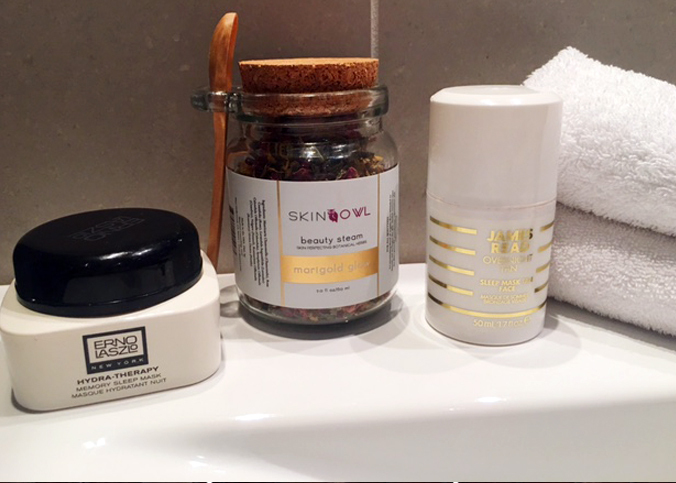 The Goodnight Co. was established by two Australian (human) moms, Shea and Danielle in early 2015. With mini humans there was a constant push and pull in a million directions and not one leading to a bed. In search of slumber, the duo set out to find the purrrfect sleep solution. 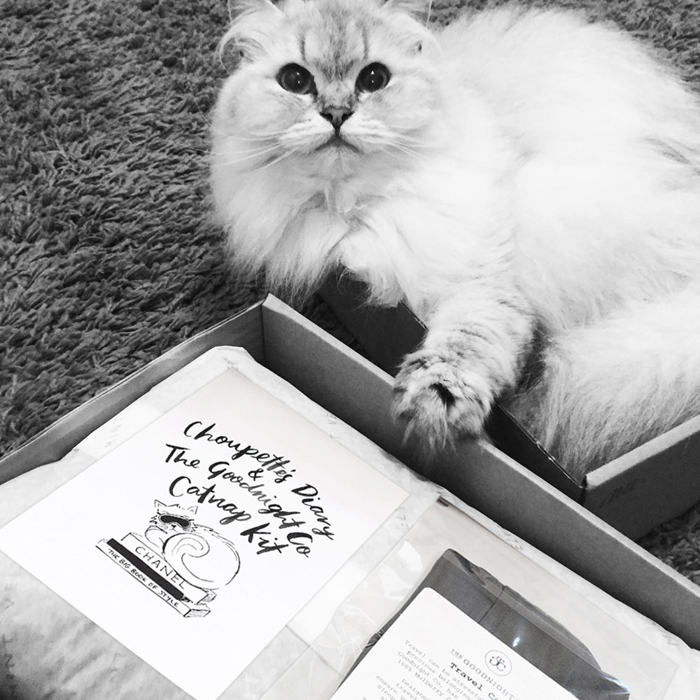 Sourcing the elusive silk that makes for the most restful catnap, the range launched with a selection of luxurious pillow cases and sleep masks that are truly to die for dahhhling!Since launching in early 2015, the product range has expanded to include silk sleep masks, sleep tees made from 100% cotton, a chemical free silk washing liquid and a range of crystals, each with a unique combination of healing properties which you can take with you, wherever your head hits the pillow. 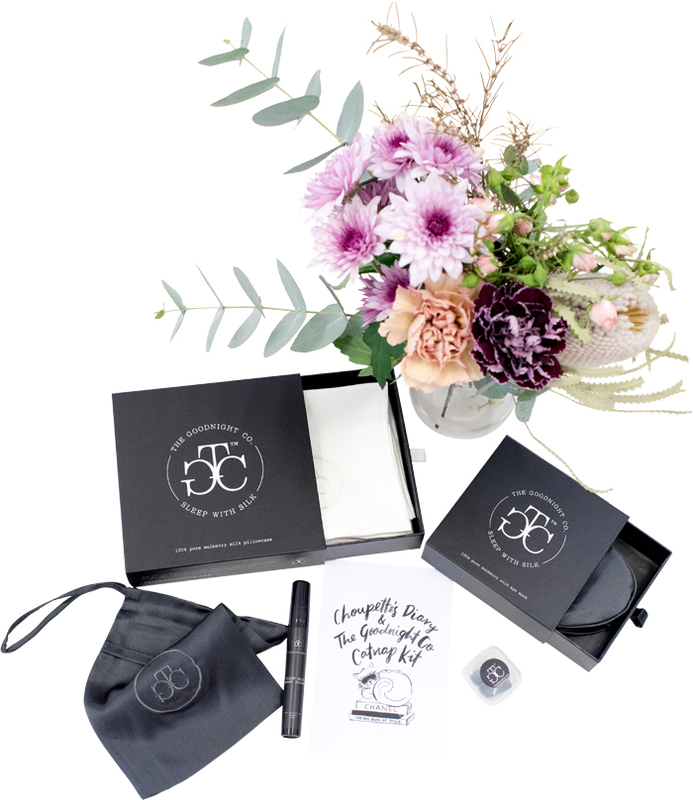 Now is your chance to get your paws on a Goodnight Co. kit personally curated by moi and launching today for a limited time! 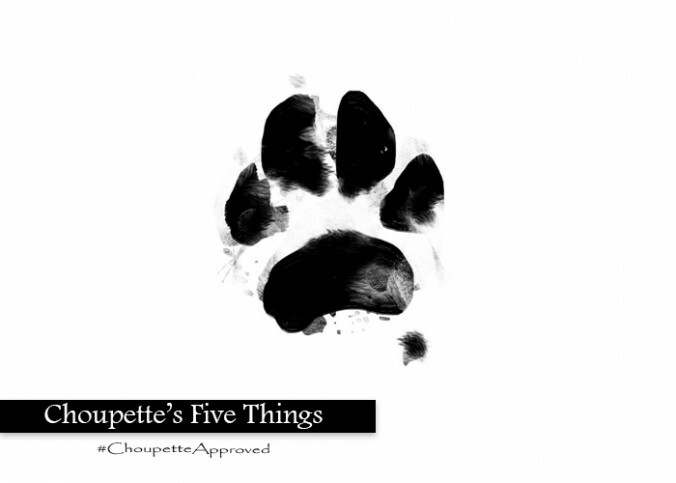 The Choupette’s Diary Catnap Kit includes a luxe silk pillowcase to prevent fine lines and wrinkles, a sleep mask for sleeping in after a long night of champs, an indulgent travel sleep mist to send you into dreamland minus the Ambien, ear plugs to drown out your noisy maids, and a convenient travel case to carry it all with you on your next jaunt. 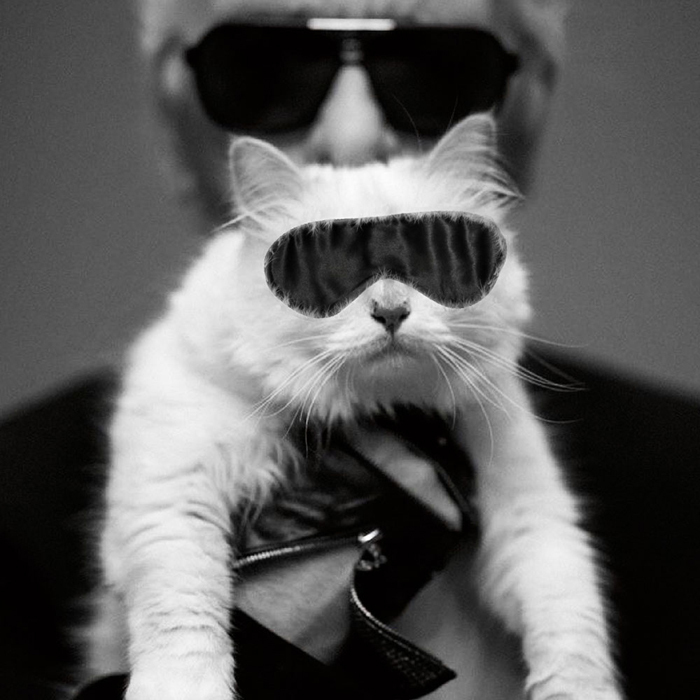 With only 500 kits available, bust out the Black Amex before it’s too late and you’re the only one left without an Instagram snap of your #ChoupetteXGoodnightCo box.